Assorted. 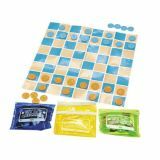 Each 4" x 3 1/4" plastic bag includes a 10 1/2" x 10 1/2" paper game board and 32 plastic 3/4" checkers each in two colors. 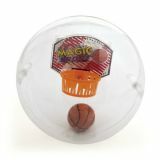 An old favorite, this game will keep you mesmerized for hours! Plastic. 2 1/2" x 3 1/4", Assorted. (1 set/DB, 1 dz. 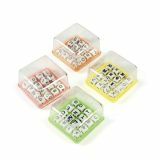 DB/pack) 4 1/4" x 4 1/4"
Assorted. (1 pc./DB) 3 1/2" x 2 3/4" No color choice available. 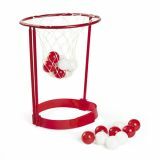 Set includes 1 adjustable headband hoop, and 20 balls. Simple assembly required. 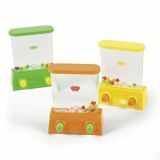 Plastic Fish-Shaped Water Games. Assorted colors. 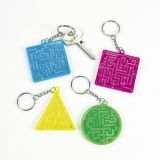 4"
Plastic Maze Game Key Chains. Assorted styles. 2", Accessories not included. 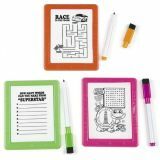 Plastic Neon Dry Erase Board Games. Assorted styles. 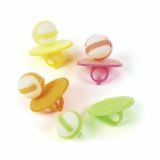 Each 3-pc. set includes a dry erase marker, 3 3/4" x 4 7/8" gameboard and eraser. Puzzle Balls. Mind-boggling plastic puzzles make great party favors! 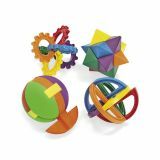 Give these bright puzzles to your little Einsteins at a science-themed party. 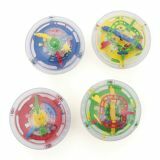 Create a unique obstacle course using these challenging brain games at each station. 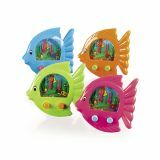 Then give these puzzle games as prizes! Assorted styles. Approx. 2 1/2" - 3 1/4" when assembled.